Review Summary: 99 appeals in parts more towards the second half. It’s one of those films where your central protagonists are small-time, bumbling crooks-in-pairs (the film calls them Laurel and Hardy—that’s Kunal Khemu and Cyrus Broacha). The very thought of going to the cinemas gives you a high. Two petty thugs Kunal and Cyrus dream of hitting a century in their life. Not literally but in terms of striking gold at least once in their lives. They get embroiled in a tangled web of bookies with almost no way out. 99 appeals in parts more towards the second half. There is a peculiar poetry to be found in the sound of metal as it scrapes, tinnily or with a steel resolve, against other material. I have a confession to make as a film journalist. Good treat for youth and multiplex audience, one time watch. Characters are well defined and authentically acted. 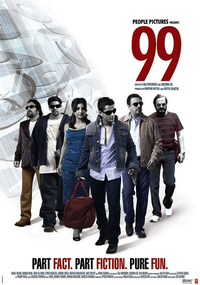 In 99, the first motion picture released by new production outfit People Pictures, the plot revolves around a duo of small-time crooks getting into more trouble than they should be able to handle.